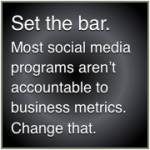 Costly social media initiatives that don’t measurably impact profit or mission. “Me too” social media that focuses on not looking bad instead of making money. Factions that vie to “own social” by launching competing initiatives. Fluffy “results” that lead executives to think “there’s no there there” in social. Punitive social policies that prevent employees from interacting and adding value. SNR is a modular agile framework that uses best-in-class fast-cycle methods to help organizations succeed with ambitious social business projects. 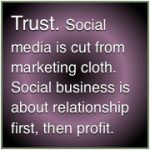 You can use this page to significantly improve your social business results. It can help you explore how you can best adopt social business, which applies peer-to-peer (“social”) technologies to business processes. The SNR is useful for assessing, testing, scaling and integrating social business into mature business processes. NextLevel—Various groups have experimented with any combination of Facebook, LinkedIn, blogging, Twitter and YouTube with mixed results, and management wants to formalize and expand the approach by using strategy to formalize and coordinate intent. NegativeUGC—The firm or a close competitor has suffered from painful “user-generated content” like United, Domino’s, KFC, McDonald’s and many more and management wants to mitigate the risk that it will happen to them. Go-to-market—The executive team wants a strategy to use social networks to support a major go-to-market initiative. StartRight—The company has little/no experience, limited resources and wants to minimize unproductive experimentation. These firms typically have very conservative cultures in which idle experimentation is very risky, so they want strategy to help them aim before firing. M&A—Management is preparing to sell the firm or merge and wants to engage stakeholders like regulators, potential buyers and analysts as well as clients. These are often fast-cycle engagements with high risk, so the firm wants to use strategy to get it right the first time. Post-merger integration—Firm leadership wants a strategy for superior outplacement, attracting new talent and better collaboration among employees. Orphans—The organization has launched blog(s)/Facebook Pages/LinkedIn Groups/Twitter accounts and abandoned them because they didn’t have the resources to engage readers. It requires explicit strategy to focus its interactions in major platforms. Lackluster—The department has built its own social network with Lotus Connections, Microsoft Sharepoint or a pureplay platform like Ning, Small World Labs or Groupsites—with tepid results. They admit that they don’t know what they are doing, or what’s possible, so they use strategy to regroup. EmployeeAlumni—Managers have heard about using social networks to change the alumni approach and want a means to pilot an alumni social network to drive down recruiting and business development costs. Industry-focused social business opportunity—Here is a summary of some of the most exciting social business opportunities I see in financial services, healthcare, retail and others. CSRA beta launched the Social Network Roadmap(SM) at the Social Networking Conference in San Francisco on July 11, 2008. You can use it to discover what your customers, partners and competitors are doing in venues like Facebook, LinkedIn, Twitter, YouTube, Vine, Snapchat, and others. You also determine what the adoption rate is in your industry and how you can apply these new technologies and behaviors to your business. For more, see the Web 2.0 Investment Strategy. CSRA Managing Director Christopher Rollyson is the chief architect of the SNR. He has been working with technology adoption since the early 1990s. The Roadmap draws from Rollyson’s experience with ebusiness strategy and transformation at PricewaterhouseCoopers Management Consulting Services during Web 1.0 in which he was a subject matter expert involved with building the firm’s roadmap and services framework while serving industry teams and clients in automotive, energy, consumer products and high tech. The roadmap also borrows from Rollyson’s exposure to agile, lean, fast-cycle software development. It manages risk by identifying, creating process for and testing the riskiest parts of a proposition prior to extensive investment. As Vice President as nVISIA, he led the development of the firm’s Enterprise Service-oriented Architecture roadmap that detailed the path and key milestones for enterprise adoption of SOA. When organizations consider disruptive technology, they are faced with understanding the disruption and how it applies to their business. They must consider the problem of how to apply it to their business processes in a way that delivers value while minimizing interruption to their existing business. One of the key challenges is gaining mindshare with people in various parts of the organization so that the assessment and application of the disruptive technology can be effective. Roadmaps are invaluable tools for companies that are adopting significant change. By articulating the adoption path, a roadmap helps educate people about how the novel technology affects their company and what they can do about it. It aligns them around orchestrated plans for action, and it gives them a vocabulary to talk about the change process. SNR Preliminary is quickly educates your team about the relevance of social business and digital transformation to your industry and organization. This is an effective way to bring people up the learning curve while realizing opportunities and threats for your industry and firm. SNR Pilot is a quick-hit way to plan, launch, manage and measure the results of social business pilots. SNR Enterprise is an enterprise-strength process for organizing a commercial or government enterprise’s social business initiatives, policies and strategy across all phases of the adoption life cycle, including feasibility, strategy, pilot, scale and integrate. It’s also a blueprint for digital transformation. Consultations help you get focused expertise via telepresence, video conference or phone. Keynotes, presentations and panels enable you to educate large groups at conferences, professional groups, and company retreats. Executive seminars, workshops and bootcamps can be ideal for briefing teams on social business drivers and impact on your industry. They feature exercises, concrete goals and materials. Most seminars are 1/2 to two days, and they include structured learning, activities, takeaways and materials. Ethnographic research of social media reveals the behavior and motivations of firms’ most important stakeholders. It improves results of social media, business innovation, product management, service design, and many others. Now you can use the SNR within the Social Channel App, which is an interactive guide to experiential social media and social business transformation. The Social Network Roadmap is transformational because its robust design enables firms to increase efficiency and lessen risk on complex initiatives. The Toolbox is a list of key how-to readings. Insights posts show SNR in action: how I use it on client work, case studies, and summaries of conference presentations. 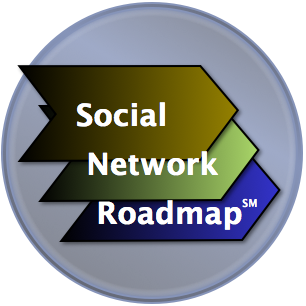 How to Use the Social Network Roadmap explains the pluses and minuses of using the roadmap in different ways. Here is the short list you can use as a starting point. I encourage you to drill down more using the longer list under Insights below. Social Business Strategy Use Cases summarizes five common situations experienced by brands and firms. Social Business Team Building explains, step by step, how to build teams in each of the use cases. The Dirty Dozen Social Business Risks: manage these to outperform. The Social Business Life Cycle: understand this to boost adoption efficiency by multiples. Social Network Roadmap Pilot discussion deck explains the value proposition and the framework: on request. Social Network Roadmap Enterprise discussion deck explains the value proposition and the framework, includes five case studies: on request. Full-length paper describing all the phases and how the methodology works: on request. Launch news release, vintage 2008, explains CSRA’s purpose in creating the Social Network Roadmap(SM). SNR’s Twitter feed: breaking news, links and thoughts on leading enterprise innovation with social business; just follow it. Social Channel App Google+ Page: I have transitioned much of SNR’s and CSRA’s activity and sharing to Google+ (see why here). CSRA Monthly Advisor: CSRA thought leadership compiled in a digest (first paragraph of each with links to full articles) and sent to the email of your choice. SNR Facebook Page: you can access much of its content without joining Facebook, but many of the features require free membership, such as sharing links, writing on our wall; just like the Page. Enterprise 2.0 Market Advisory: Somewhat vintage, but the basic premises are just as valid today as in September 2007. 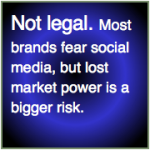 Social Networks Market Advisory on Consumer Empowerment: is a short read that was written in 2007, but it’s amazing how well it has held up. There are several ways that you can use the Social Network Roadmap(SM) to make your experiential social media and social business initiatives more rewarding. I also lead private executive briefings and public workshops and seminars at conferences worldwide that last from two days to half a day. Use the Seminar Widget or the Presentations Widget to learn more. Most executives fear the free-wheeling nature of social media, and their legal fears are consummated by high-profile examples of people assaulting brands. That said, a far larger risk is lost business: since social business cuts the cost of relationship (business) by a factor of ten, delaying adoption by writing punitive policies is the prevalent social business risk. Happily, astute CMOs can use the process of creating and managing social business policies to learn what the real risks are and develop trust among executives and employees. In addition, understanding other risks enables CMOs to make fewer mistakes than rivals and get more done for less money. The Dirty Dozen Social Business Risks gives you a holistic view of risks CSRA sees on engagements with global brands. Social Business Policy shows you, step by step, how to use social business governance to provide legal protect and encourage productive interaction. How do I herd the social media cats? Social media has followed the predictable pattern of disruptive adoption: in the beginning, different businesses experiment with it before the executive office really cares about it. 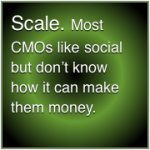 Many a CMO these days faces growing social media budget item and little-to-no quantifiable business returns. Various brands/businesses have rolled their own/hired their own agencies. The CMO can use social business strategy to provide a keel that resonates with corporate strategy, addressing issues as diverse as profit, corporate citizenship, community, health or policy. Moreover, digital marketing and firm executives are thinking about building their internal teams to provide more continuity and scale. Learn how to use social business strategy to herd the cats and get real business returns. How can I transform while operating my business? All leaders of transformation initiatives face this issue, which is quite manageable when they build authority based on facts, use authority to build trust and set expectations, and introduce new methods using agile methodologies. The Social Network Roadmap itself is designed to cut risk during all parts of the social business adoption cycle. The four digital competencies that organizations are discovering they painfully lack are social business, big data & analytics, mobile and omni-channel/ecommerce. Because customers increasingly use digital devices to do everything, “a little digital” (incremental change) doesn’t suffice; unplugging processes that alienate customers needs to happen, too. Social Business Enabler of Digital Transformation shows how to practice social business transformation—and use it to accelerate adoption in big data, ecommerce and mobile. Transform the Enterprise is a step-by-step approach to building enterprise-scale social business competency. 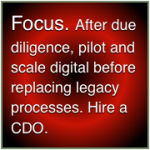 CMO, CIO, CDO: how do we do digital, fast? You have heard and dealt with consumer technology (BYOD) taking over the enterprise, but there’s a higher level of the trend that’s exposing an uncomfortable truth in many boardrooms: “We don’t know our customers anymore. They’re acting different, and our businesses are flat.” Meanwhile, most businesses are hamstrung with analog business processes, and customers increasingly ignore them. The board issues the “go digital” imperative. Sitting executives (usually CMO or CIO) have some of the skills to lead digital transformation, but they don’t have the bandwidth, having “done more with less” for many years. They also lack critical skills in big data & analytics, social business, mobile and omni-channel. The Chief Digital Officer (CDO) will play a vital role because s/he has top skills and can focus full-time on digital transformation. 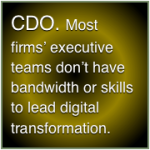 Read about various types of CDO and what “kind” you might need. Social this, social that; what’s the difference? Digital social technologies and behaviors are evolving very quickly, so there is much confusion about terms and practices. “Social media” is widely understood as using platforms like Facebook and Twitter. “Social business” is a relatively new term (except around here ;^) that often denotes increased profit focus while using social technologies. Adding to the confusion, many social media consultants are “rebranding” themselves as social business consultants even though they often lack key business competencies. “Social enterprise” denotes an organization with a double or triple bottom line (profit, social good, environmental good, etc.). As practiced by CSRA, social business aims to interact efficiently in order to increase trust—because money follows trust. When someone spends money on your product, that is a higher order social action, and you can use social technologies to progress up the ladder of social actions (trust) faster and cheaper than ever before. Meanwhile, social media is a largely promotional channel for marketing content with “interaction light.”Using Social Media and Social Business Together to Evolve Experience shows how the two are different competencies and how CMOs can use them both to increase profit. Where are you in the life cycle? CSRA guides businesses through all phases of the life cycle, so the Enterprise Social Business Life Cycle summarizes its phases based on that work. Get even more detail by studying the Social Network Roadmap Enterprise (above), which addresses all five phases and focuses on maximizing enterprise value. A detailed explanation of its phases is available on request. Just contact me.